Much of the time we work on individual parts of our restoration projects, but there comes a time when several of these parts can come together as subassemblies. In this article we want to show how several topics that we have previously covered can go a long way to making your restoration project more manageable as well as more enjoyable. For those previous articles, see Organization, The Threaded Rivet, Rotary Tools, and Electrical Connections . 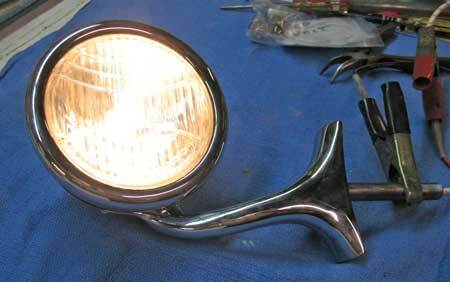 Let's look at the reassembly of cowl lights used on our Lincoln Sedan restoration project. They were earlier disassembled and sent to the chrome plater. In order to maintain quality around mating pieces, the lights had to be disassembled before plating. It is paying attention to details like this that makes all the difference in the overall quality of our final restoration. 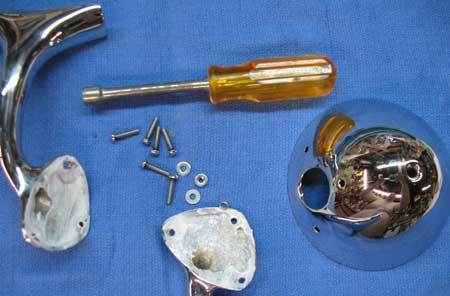 Disassembly involved using small rotary tools, namely the mini cut off wheels and carbide tools. Three small rivets were ground down from the inside where any scratches that might occur during the grinding process wouldn't be seen. 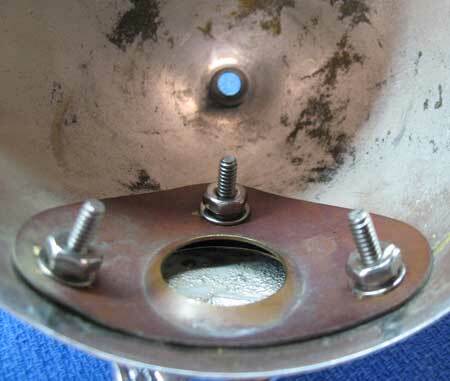 The inside brass sheet retainer is gently pried off and the cowl's back shell and separated from the mounting bracket. 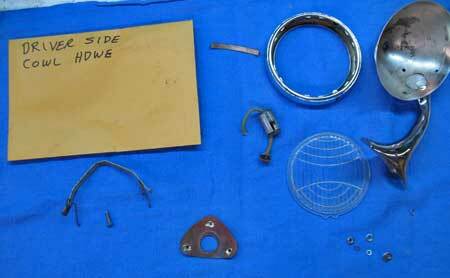 Photo 1 (photos start on page 2) shows the cowl lamp parts as they came back from the plater. This is where our organization comes into play. By placing parts in separate envelopes, it will be easier and more logical when we need the various pieces required for reassembly (Photo 2). We now refer to our discussion of using Threaded Rivets. 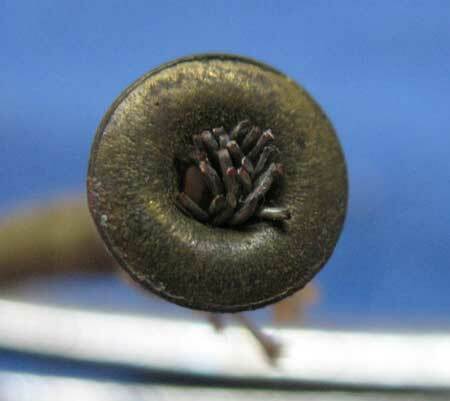 Threaded Rivets come in many sizes. The hole size in this case is clearly a #6 and two head styles are available, the Truss Head and the Round Head. The Truss Head fits over the hole, but the Round Head fits down in the bracket's recessed hole and more resembles the original rivet (Photos 3 & 4). Before attempting reassembly, test fit all components. Sometimes the plating process can change hole sizes just enough to be problematic. A light coating of clear adhesive/sealant is applied to the bracket's mating surface before reassembly of the shell (Photo 5). Photo 6 shows the cowl lamp thus far. A step that was performed several years ago was to have the cowl lamp reflectors recoated using the UVIRA process. 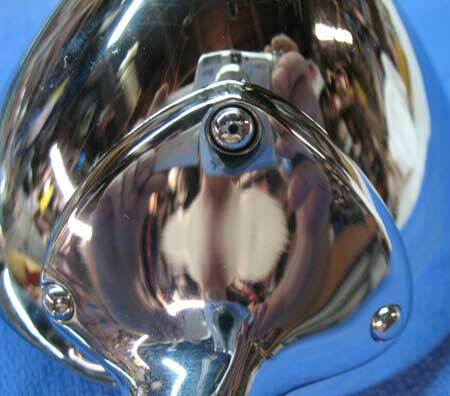 Reflectors are first nickel plated and sent to the UVIRA Company and a specialized coating is applied. This is the same coating used in medical operating room lighting systems. It yields higher reflectivity than resilvering (see Photo 7). As we learned in our Electrical Connections article, good connections are the result of both mechanical (crimp) and soldered junctions. We wanted to improve the grounding of the bayonet socket to the bracket and the shell. As desgned, the socket relied on a mechanical friction fit into the reflector to provide its ground connection. It may be adequate, but it does rely on the reflector making good contact to the front bezel and spring retainer. Over time, oxidation and dirt can (and usually does) cause a less than desirable ground. One better method for a good ground connection is to install a separate ground wire to the base. Photo 8 shows the separate ground wire soldered to the back of the socket. We can also improve the electrical contact inside the bayonet socket where it connects with the bulb. Photo 9 is the original crimped terminal. Since a new wire needs to be included in our reassembly and long enough to travel to the car's light controller, we decided to reuse this original terminal. Photo 10 shows it being salvaged and reused, Photo 11 is the finished soldered terminal and Photo12 has the new wire threaded through the round insulator and spring before being inserted into the bayonet socket. As the front bezel is now fitted with its glass lens and retainer clip, it is ready to marry the front bezel to the shell. 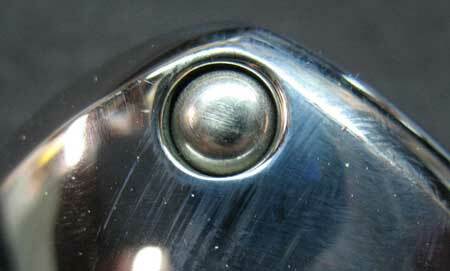 The front bezel is secured using a new chrome plated oval screw from the back of the shell. Check that there is ample clearance between the retainer clip and the wire coming through the bayonet socket (Photo 13) and the power wire does not get pinched between the retainer and the shell. Photo 14 shows the finished light being tested using a 6 volt source (Photo 15). These cowl lights can now be set aside until we're ready to mounted them on the car. 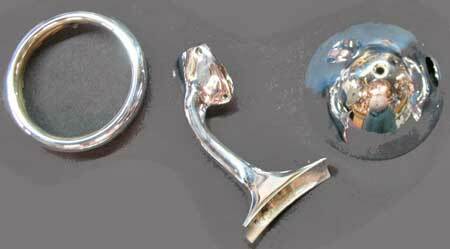 Photo 1 — The three components of the cowl lamps as they came back from the plater; left to right they are the front bezel, the bracket, and the shell. Photo 2 — Keeping things organized makes a world of difference when reassembling parts like these cowl lamps. Each envelope contains the cowl lights hardware, socket and glass lens. Photo 3 — Shown is a 6-32 Truss Head Threaded Rivet as a possible candidate for reassembly. It fits inside the hole and covers the hole well, and despite its low profile, it just doesn't seem to do this brackets justice. 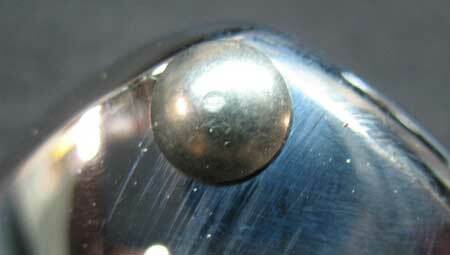 Photo 4 — Shown is a 6-32 Round Head Threaded Rivet as the other choice. Its fits into the recessed hole well and the round profile is a match for the original rivet. All six round head threaded rivets are polished before using them for assembly. Photo 5 — A thin bead of sealant is applied to the bracket's mating surface before adding the shell and the inside brass sheet retainer. Photo 6 — Inside view of the cowl lamps showing the threaded rivets, flat and split ring lock washer and nut. 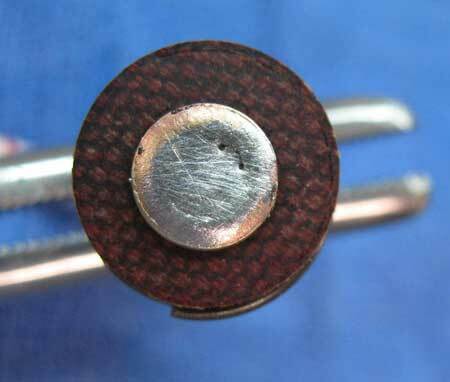 A nut driver quickly twisted tightens the threaded rivet fastener. Notice the machine threads are longer than need to be and the excess threads are easily removed using the small cut off wheel in our rotary tool arsenal. Photo 7 — The cowl light reflectors were recoated several years earlier and carefully stored waiting to be assembled. 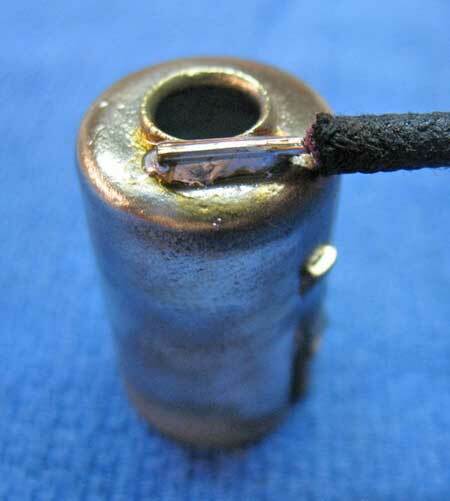 Photo 8 — A separate ground wire is soldered to the back of the socket for an improved ground. Also see Photo 13. 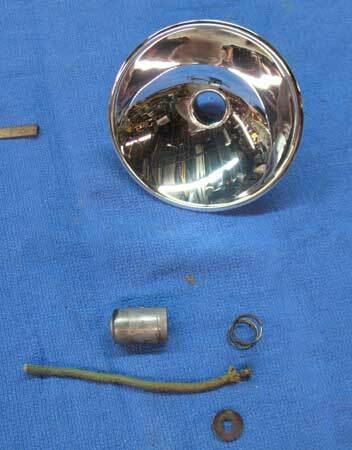 Photo 9 — This is the original base contact inside the bulb's bayonet socket. It was originally crimped leaving wire strands to make contact with the bulb. While this may work, it can be better. 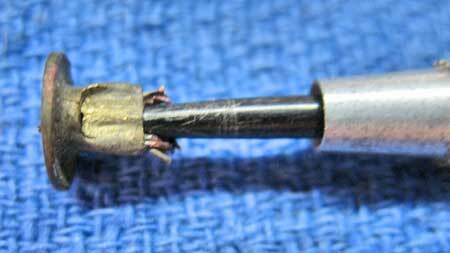 Photo 10 — A small pointed scribe is used to widen the terminal's end where the wires pass through it. Photo 11 — The finished terminal after crimping and soldering. 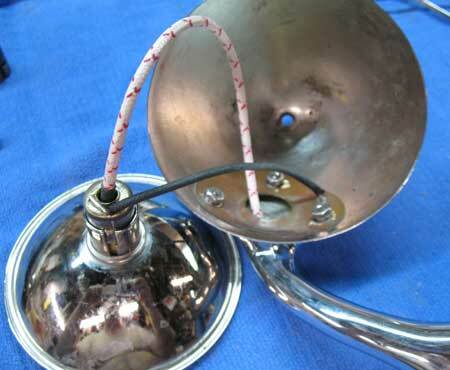 The soldered surface will make a better contact with the bulb than bare wire. Photo 12 — A small segment of shrink tubing is applied over the terminal's base. 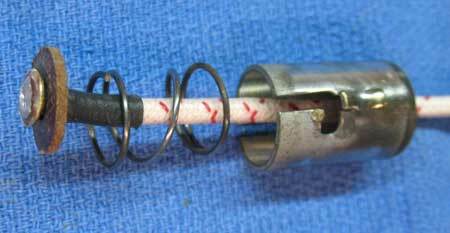 The wire is threaded though the round insulator and spring. Photo 13 — The other end of the ground wire gets a #6 ring terminal soldered to it. The value of using a threaded rivet here makes it easy to include the ring terminal as a good grounding point. Photo 14 — Rear view of the assembled cowl lamp with the polished threaded rivets in place. Photo 15 — The completed cowl lamp is tested using a 6 volt source. The cowl lamps can be set aside ready for installation.